GREENVILLE – Monday through Friday, a hearty collection of older folks make their way to the Greenville Senior Center for lunch. They pile paper plates high with meatloaf, mashed potatoes, carrots and tiny bowls of canned fruit. 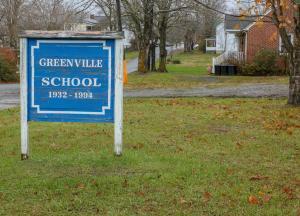 Sipping Styrofoam cups full of coffee and sitting at long tables in the cafeteria of the former Greenville High School, they discuss local headlines, the weather, crop reports and whatever else people of that demographic like to chat about. They come for the food, of course, but it’s also a chance to catch up with friends and neighbors. “There is a real sense of community,” said Skip Heath, a volunteer with the Monroe County Council on Aging, the group that organizes the meal. Most attended school there, and Heath said the meal is a chance to relive the old days. One of his favorite stories centers on a set of holes that line a wooden ladder in the main building on the former school’s campus. He was told the holes were made because the football players would wear their cleats when they ascended the ladder to suit up for games. That former football field is now ringed with three gleaming new apartment buildings. Greenville Senior Manor consists of one and two-bedroom units. Each apartment features a full kitchen, washer and dryer, full bathroom and walk-in closets. Heath, who has been leading the project, saw the need for new, affordable housing for Monroe County’s seniors. Heath and his team at the Monroe County Council on Aging started this project in 2017 and worked closely with members of the West Virginia Housing Development Fund’s HOME Investment Partnerships Program. The primary objective of the HOME program is to expand the supply of decent, safe, sanitary and affordable housing, primarily rental housing. Heath, who had a long military and consulting career, had never done housing before, leaned heavily on Fund staff during those initial stages. “Cathy Colby (the HOME program’s senior manager) and Megan Howard (the HOME program’s rental program administrator) were great to work with,” he said. Just to add to an already-daunting challenge, the project had to overcome several obstacles. Because the nearby high school is considered a building of historical significance (it was designed by architect Walter F. Martens, who also designed the West Virginia Governor’s Mansion), the state’s Division of Culture and History’s State Historic Preservation Office had to sign off on the development. The construction site was ideal, but there was no road leading directly to the buildings. Heath and his team would later write a grant to get a section of the area paved. What almost derailed the entire project, however, was a lack of proper sewage disposal. When it was operational, the school used a tiny package plant. That would not suffice for the new development. Undaunted, Heath and his team were able to secure funding to purchase and install a new, state-of-the-art waste water treatment facility. “I call this project The Little Engine That Could,” Heath said, citing the popular children’s book about a tiny locomotive tasked with a monumental job. “We just kept saying I think I can, I think I can, I think I can,” Heath added, using the book’s iconic refrain. Their persistence paid off and the first two buildings were completed in August 2018. The third building is set to open in December. Diane Solomon is one of the first residents. She made her way from Arizona to Greenville to be closer to family. While the landscapes outside her door look nothing like the desert vistas she is used to, she knows the rolling hills of Monroe County have their own charm. Solomon likes the silence. It gives her a chance to read and write letters. Her back porch looks out over a nearby farm. Heath said they are busy recruiting tenants and plan to be at 100 percent occupancy in the coming months.